Wright State presidential candidate Dennis Shields says he is student-focused, would work to improve outcomes and affordability for students, and would be eager to tackle budget challenges facing the university. Shields, chancellor of the University of Wisconsin-Platteville, is one of three finalists for the Wright State job. He met with students, faculty, staff, administrators and community leaders Feb. 2-3 in forums at the Dayton and Lake campuses. Shields said Wright State is probably too modest about its successes. Founded in 1866, the University of Wisconsin–Platteville sits on 821 acres in southwest Wisconsin. Part of the University of Wisconsin System, the public university has three colleges, offers bachelor’s and master’s degrees and serves 8,700 students on-campus and another 3,000 students through its five distance education programs. From 2004 to 2013, total enrollment posted a record increase of nearly 40 percent. The school’s mission statement says it promotes excellence by using a personal, hands-on approach to empower students to become broader in perspective, stronger intellectually and ethically, and to contribute to a diverse global community. 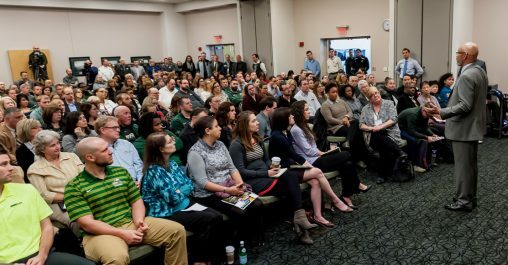 He said Wright State can reduce costs to students by helping them get their degrees in a timely fashion and that any tuition increases should be modest. He wants students to have an undergraduate research experience, an opportunity to be leaders and to be involved in things that take them out of their comfort zone. He said studying abroad, for example, is probably the most transformative thing a student can do. Shields said recruiting international students has become more volatile and that schools must always look for new opportunities. Asked about the role of athletics at Wright State, he said athletics can attract some students to the university, but that it’s more about the pride it creates in the community. “It should be as lean as it can and still be effective,” he said. Dennis Shields met with students, faculty, staff, administrators and community leaders in five forums at the Dayton and Lake campuses. Shields said the liberal arts produce students with leadership, writing and critical-thinking skills, which are in demand by employers. “They’re needed more than ever,” he said. He said research is very important at Wright State and that there are “real opportunities” to expand the university’s applied research. Shields joined the University of Wisconsin-Platteville in 2010. Before that, he served as acting vice president of student affairs at the City College of New York-City University of New York. Previously, he served as dean and professor of law of the Phoenix School of Law. He also worked at Duke University School of Law as associate dean of admissions and financial aid and assistant dean of admissions and financial aid, and served as the assistant dean and director of admissions at the University of Michigan Law School. Shields, who spent the first five years of his life in an orphanage and later grew up in foster homes, said he pursued a career in higher education as a way to help people improve their lives. Since he has been at the University of Wisconsin-Plattville, the number of minority students has doubled and their academic achievements have improved. Last year, Shields was forced to cut his university’s budget by $8.5 million. He said administrations must be open and transparent with students, faculty, staff and taxpayers in the budget process, have the agility to capture changing revenue streams and take control of its university’s own destiny in light of diminishing state support. He said the president is the “fundraiser-in-chief” and that he recently helped his university raise $2 million for an endowed professorship. He said Wright State is “ahead of the curve” in its capital campaign. Shields earned his Bachelor of Arts in Business Administration from Graceland College and his Juris Doctor from the University of Iowa College of Law. Shields said his leadership style is to empower people, develop talent and teamwork, take the blame when things go wrong and fix mistakes. A lawyer by training, he said he enjoys give-and-take discussions and thinking strategically about policy issues. “I will be a passionate advocate for this institution,” he said. 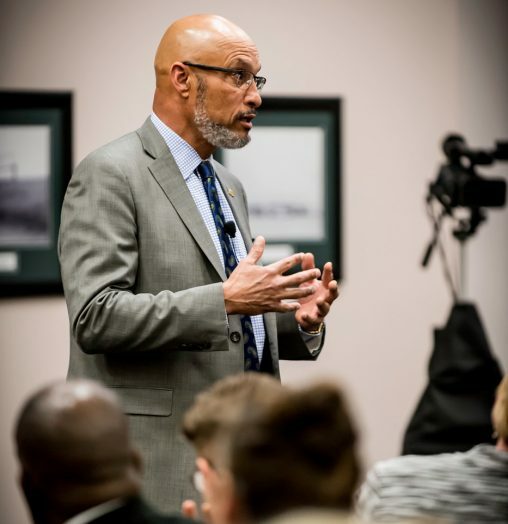 More information about Shields — including his CV, letter of interest and links to his forums at Wright State — is available on the university’s presidential search website.